In the middle of the pic is the Salthouse at Port-Eynon , with the main beach beyond and Sedgers Bank to the right . For 50 years , from the mid 16th century , these buildings were used as a Saltworks. Seawater was pumped from storage tanks and heated in pans to evaporated the water and leave the salt . The buildings were later used by Quarrymen and Oyster Fishermen until abandoned in the 1900's. Recently conserved, it remains a unique example of a 16th century coastal saltworks. 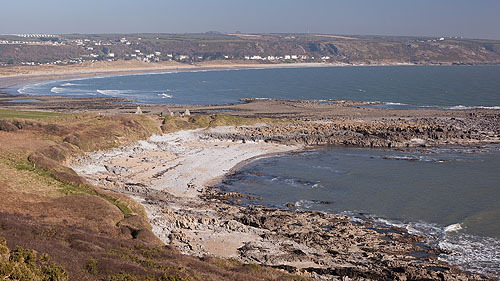 Sedgers Bank is the only remnant of the sand bar that once enclosed a now extinct salt marsh at Port Eynon.